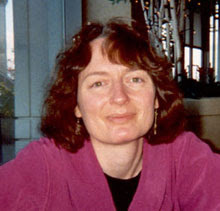 Amy Patricia Meade moved from New York City to Arlington, Vermont, during the emergence of her three mystery novels. Charming "who-dunnits" set in Connecticut in the 1930s, they contrast the intimate rural feel of a village where everyone knows everyone else -- most especially the village's crime-into-fiction writer Marjorie McClelland -- with the zest and gritty threat of not-too-distant cities like Boston, and the wealth and culture of Marjorie's sweetheart, Englishman Creighton Ashcroft. All of Meade's titles come from music of the period. The first of her series is MILLION DOLLAR BABY; the second is GHOST OF A CHANCE, from Bing Crosby lyrics about a lover who doesn't stand a ghost of a chance with the object of his affection. (The flippant heroine, Marjorie, very nearly misses her chance, too.) And the third is SHADOW WALTZ. Of the three, SHADOW WALTZ exposes the most "crime" and requires the most detection. It could be read on its own ... But because each of the books depends strongly on romance threads that build through the series, I'd suggest reading the three in sequence. That's also a good way to warm up to Meade's gently teasing sense of humor, which involves lovers hidden under a hospital-type gurney, a meddling set of neighbors determined to turn a wedding into a mystery party, and plenty of culinary amusements as well. Marjorie sat beside Mrs. Patterson on the Beidermeier sofa. "Oh! I thought they'd never leave. And then you went ahead and invited them for dinner. I don't know why you'd do such a thing, Creighton. What's gotten into you lately?" "Just being nice, darling. I feel for Jameson...." He shook a chrome shaker filled with ice and gin and emptied the contents into the three vermouth-coated glasses. "Now, however, I'm here with two beautiful women and three perfect martinis--"
"Four perfect martinis," he amended as he grabbed another glass from beneath the bar. Arthur appeared in the living room doorway with a stocky, ruddy-faced man with light-colored hair. "Officer patrick Noonan," he announced. Kirkus gave a modest thumbs up to this third book, saying, "the sparkling Marjorie and her amiable beau make an engaging pair of sleuths in their third appearance." For all sorts of reasons -- the tie to the 1930s, the music themes, the light romantic plots, the gentle cleverness of the crimes, and even the Vermont residence of the author -- Meade's series is a sweet summer reading handful. Oh, and don't miss her vintage web site with the classy car and theatre marquis: www.amypatriciameade.com. Dave's the official mystery pro here at Kingdom Books, and I handle the poetry -- but that's only one side of things. I've been reading mysteries for as long as Dave has, and he's far quicker at researching a poet's life than I am. At any rate, things work out well. I mention this because while Dave cut his eyeteeth on "noir" among mysteries, my early reading was thoroughly British, to the point of knowing various pen names and probably reading (alongside my mother) every John Creasey and Agatha Christie available by, say, 1964. Only recently have I noticed that "British" in those days meant "English" to my mom. So the realms of Scottish mysteries are a fresh delight to me. Some years back, one of our clients woke us up to William McIlvanney's stunning Glasgow series featuring Jack Laidlaw and his mates. McIlvanney is better known in Scotland as a noted poet, but LAIDLAW (1977) won the British Crime Writers Association (SWA) Silver Dagger Award. You can tell the subgenre right away by knowing that Ross McDonald praised the book upon publication. McIlvanney's crime novels are dark, moody, unpredictable, and give a Glasgow version of the depression and darkness of police work that Henning Mankell also paints. Denise Mina, also of Glasgow, brought out her seventh crime novel this year (2008), titled SLIP OF THE KNIFE in the US, and THE LAST BREATH in the UK (2007). Her ear for dialogue is magical, and the books are gritty, dark, violent, and sometimes shockingly funny. I'll do a full review of one of her books later. Entirely new to me this month (you know, there are so many mysteries that this could keep on happening...) are the police procedurals of yet another Scottish author, Quintin Jardine. 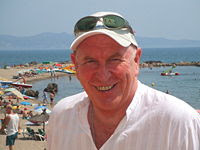 Jardine is from Edinburgh and now also lives in Catalan at times; I've placed one of his photos at the top of this post, but Jardine's self-images on various web sites and in his books are wildly divergent, from grizzled and grim to bright public relations star to the very urbane one here. The characters in his books range over the same wide diversity. There are two Jardine series. The one I dipped into this week is his longer series, 18 books so far, featuring Deputy Chief Constable (at least, that's his rank in HEAD SHOT, the 2002 volume I started with) Bob Skinner. Bob's a well-respected supervisor with long, deep friendships, and a streak of mellow affection that contrasts with the darker Mina books. SKINNER'S RULES was the first Skinner crime novel, in 1993; this year AFTERSHOCK came into print. Although it wouldn't be a disaster to start in the middle of the series, as I did, the books refer often to events in their predecessors -- so it's probably better to begin with SKINNER'S RULES. Luckily, these are in paperback, which makes it less costly to work from the older volumes forward, and then if you decide you have to own the full hardcover series, they're still around. Jardine's other series is a first-person set, featuring Oz Blackstone, also a Scot and fond of golf as well as investigation. The first two of these came out under a pen name, Matthew Reid: BLACKSTONE'S PURSUITS (1996) and A COFFIN FOR TWO. A 2004 reprint brought these two together under Jardine's name. Most recent, the ninth in the Blackstone series, is FOR THE DEATH OF ME (2005); number ten is expected soon. Okay, let me double back to HEAD SHOT, the 2002 Bob Skinner police procedural that I picked up. I suspect this might be the least favorite of all the Skinners for American readers, actually, because a chunk of the action takes place in the US, diluting the "foreign" feel of Jardine's work. Jumping the main character from upstate New York to DC and through a maze of FBI and local jurisdictions just isn't as much fun as following the side plots back in Edinburgh, where Mario McGuire is confronting what it means to be both a rising police officer and heir of an Italian family business. I especially like the notion McGuire promotes, that the Mafia presence in Scotland is a thing of the past. What a wonder to live in a place small enough where that assertion could be true! Still, I'm not quite convinced... and neither are the Scots around Mario and his highly competitive wife. What the US dilution of Bob Skinner's investigation lacks in tang, Mario McGuire's increasingly dangerous situation more than makes up for. And it's clear that Skinner's plans for his department have kicked a lot of this into gear. I got more and more involved with the book, and when I hit the totally unpredictable ending, I literally gasped. Jardine knows how to put real power into his plots, and his characters can make your heart ache. He heard a heavy sigh. "Okay, I give in. What's with the 'Play it again, Sam'? What did you mean by that?" Skinner chuckled, but grimly, without a trace of a smile. "It's my suspicious mind at work; the whole thing made me think of Casablanca, my favourite movie. Remember where Bogart says, 'Of all the gin joints in the world, she had to walk into mine'? Well, my friend, tell me this. Of all the vulnerable lakeside cabins in the great United States of America, why did this guy have to walk into Leo Grace's?" Sorry to have been a bit quiet this week; two long days of planning for The Frost Place (www.FrostPlace.org) have kept me on the road, and then I decompressed with a frantic surge of reading time: I needed to find out what the buzz meant about Stephenie Meyer and her new series that's been both a teen and adult hit, so I cruised just about nonstop through the first volume, TWILIGHT. If you've become a Meyer fan, you're waiting for the fourth volume to come out later this month. Meyer is an impresive writer of mixed romance/thriller at the young adult level -- think Ann Rice with a rapid pace and the amazement of boy meets girl at high school level. I'm glad I tackled the tale. Now, back to POETRY (and tomorrow, Scottish mystery). Kingdom Books will host its second summer Poets' Brunch on Saturday July 12 at 11 a.m. with poet/publisher April Ossmann, who sent us the following announcement. As she mentioned, this will be handy for poets who came to her reading with us last year and already knew they wanted to meet her publisher side. Learn how to think like a poetry editor! In this one-session workshop we’ll turn the usual workshop model on its head and not only allow the poet being critiqued to speak, but to speak first and critique their own poem, discussing correlations between the criticisms s/he has for other participants’ poems and her/his own before group discussion begins. This will offer a taste of what it means to be both poet and poetry editor, a position in which it becomes easier to objectively assess your own work; to spot dull vs. energetic syntax, generic vs. original imagery and other strengths and weaknesses you may have overlooked. It also empowers the poet in the process, and engenders an unusually congenial workshop atmosphere. Participants are invited to send two poems (no more than two pages total) prior to the workshop. We will address one or both poems in the class (depending on time constraints). Participants will receive written editorial suggestions for both poems from the instructor. Pre-registration required; limited enrollment. Info: aprilossmann@hotmail.com or (207) 645-3107. 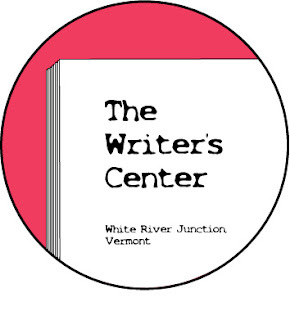 Visit www.thewriterscenterwrj.com for ongoing updates and other seminars. On Tuesday, July 1, Kristen Laine and Jim Collins will be reading from their recent non-fiction works in the Wren Room at Sanborn House at 4:00 pm. Jim Collins, a former editor of Dartmouth Alumni Magazine and Yankee, has written magazine articles for many national publications. 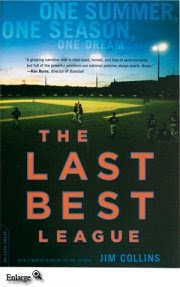 His recent book, The Last Best League, is a narrative account of a season in the Cape Cod Baseball League - the country's premier collegiate summer league and launching pad to the pros. Kristen Laine is an award-winning journalist whose commentaries can be heard on Vermont Public Radio. Laine returned to her hometown, Elkhart, Indiana to write the story of The Concord High School Marching Minutemen and the resulting book, American Band won the 2007 L.L. Winship/PEN New England award for non-fiction. There will be a small reception following the reading in the Poetry Room. For directions, www.dartmouth.edu. Poet April Ossmann is also the executive director of Alice James Books. I asked her how the two forms of devotion dovetail, and she said firmly that being a poet gives her insight into work that comes to the press -- and wrestling with work that comes to the press causes her to raise the bar for her own work. waiting for that happy family of four? (the soul so deeply asleep it needs slapping awake)? or what's been tossed in my soul. on idolatry--or a form of grace? what mercies or cruelties are not possible? Ossmann's choice of form creates a dance on the page, that sense of backing and then pressing forward again in a ballroom dance or even a two-step. I like it. I’m a seize-the-moment sort of poet, writing at any time of day or evening, mostly at home, but also on airplanes, hiking, driving, and once, on a ski lift. Mostly, I write in a white heat, writing the first draft and immediately going on to further drafts until the poem is good enough that I’m not embarrassed by it (my first drafts are mostly awful). I keep a notebook where I record poems written while traveling, and scraps and ideas that might become poems, colloquialisms (like “numb as a pounded thumb”), and anything else that intrigues me enough that I want to remember it. It’s a wildly random collection, including a bunch of “definitions” (“The wind is like the air, only pushier.”) by 5th and 6th graders that someone once emailed me. I love the challenge of working those oddments into poems. “Epergne,” one of the poems in my book, Anxious Music, happened that way. I spent a morning reading two of Mark Doty’s books, My Alexandria and Atlantis, and when I stopped to look up “epergne” in the dictionary, I got caught by a several other words I found en route: “ensorcell,” “ensphere” and “ensoul.” They are such great words, and I was so astounded to learn that the word “ensoul” existed, that I challenged myself to write a poem using all four words. The poem owes some of its inspiration to the two books, but also to Wallace Stevens’ poem "Sunday Morning" (one of my all-time favorites), because so much in those beautiful books (which deal largely with grieving the slow and painful death of a lover with AIDS) brought Stevens’ line, “Death is the mother of beauty,” so vividly (and cruelly) to life. Last year a friend gave me a clipping from a Boston newspaper about Jennifer S. Flescher's new work, TUESDAY: An Art Project. I bought a charter subscription to this unbound poetry, photo, and art "periodical" that arrives twice a year as a surprise package of exhilarating design, provocative text, and striking images. Joyce Peseroff "No More Sorrow"
New England charm is often created and supported through the visual artists who portray the region. This is especially true of the children's books illustrated by Tasha Tudor, whose New Hampshire farm, Corgi dogs, and flower gardens accompanied her painted rosy-cheeked children and their adult friends in all seasons. Tudor died at her late-life home in Marlboro, Vermont, on Wednesday June 18 at age 92. There isn't room on this page for the extensive list of her work -- but there's a well-written LA Times obit to read if you like. 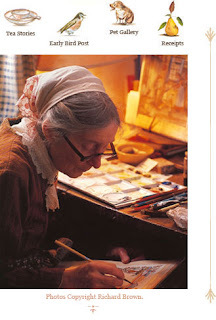 A brief note on the photo above: This is one of Richard Brown's photographs, and we hope that he'll forgive its use today; Brown's photo portrait book THE PRIVATE WORLD OF TASHA TUDOR is revealing, tender, and crafted with something of a Dutch painter's use of light. He told us in the past that the work with Tudor in her determinedly old-fashioned home functioned as an internship in photographic lighting for him, teaching him more than he'd imagined was ahead of him. The book is still available (although we're out of copies here at Kingdom Books), and we both recommend it. Coming next week: A look at the very different illustrations and booksmithing of Barry Moser, an adopted New Englander. Somebody ordered our copy of ANARCHY AND OLD DOGS by Colin Cotterill just a few weeks after Dave put it onto our list of books for sale. That's all it took for me to change my priorities: Number 1 became "read some Colin Cotterill before the books all get purchased." And I'm reall really REALLY glad that I did. I picked the first in Cotterill's "Dr. Siri" crime novels, THE CORONER'S LUNCH. Set in Laos, with plenty of ties to Vietnam, some to India, even China, the book features a 72-year-old doctor who, in the "secret war" of Laos in the mid 1970s, finds himself suddenly the National Coroner for the newly liberated and communist-driven nation. Performing autopsies with an old textbook propped in front of him, using contacts with a chemist, a detective, and plenty of determined women, Dr. Siri discovers that he likes the adventure of sorting out unnatural deaths. Of course, threats to his own life come with the new territory, and those aren't such fun. Nor is his blossoming awareness of ghosts of the departed who come as "guests" to his autopsy tables. This is an amazing "first in series" because the plotting is professional, the character drawings are first-rate, and a sparkle of humor and kindness keeps the pages turning. Dr. Siri has the kind of courage and initiative that most of us would love to identify with (but can't afford to indulge!). Cotterill, born in 1952, is British, but for much of his life this trained teacher has lived elsewhere: Australia, Japan, and now Thailand, from which he can readily cross the water to Laos to check settings and scents. THE CORONER'S LUNCH (Soho Press, 2004) was followed by DISCO FOR THE DEPARTED and THIRTY-THREE TEETH, which won the 2006 Dilys Award. Then came ANARCHY AND OLD DOGS. Shortlists for the 2008 CWA / Duncan Lawrie Daggers were announced at a reception at the British Library on 3rd June. This year we have launched an online forum on this site where you can discuss the books in contention for the Duncan Lawrie and Duncan Lawrie International Daggers. Bookings are now being accepted for the Awards Dinner, to be held at the Four Seasons Hotel in London's Park Lane on Thursday 10th July. The authors shortlisted for the £20,000 Duncan Lawrie Dagger, the world's largest prize for a crime novel, are James Lee Burke (The Tin Roof Blowdown), Colin Cotterill (Coroner's Lunch), Frances Fyfield (Blood From Stone), Steve Hamilton (Night Work), Laura Lippman (What the Dead Know) and RN Morris (A Vengeful Longing). There are five authors in the running for the Duncan Lawrie International Dagger: Andrea Camilleri (The Patience of the Spider), Stieg Larsson (The Girl with the Dragon Tattoo), Dominique Manotti (Lorraine Connection), Martin Suter (A Deal with the Devil) and Fred Vargas (This Night's Foul Work). 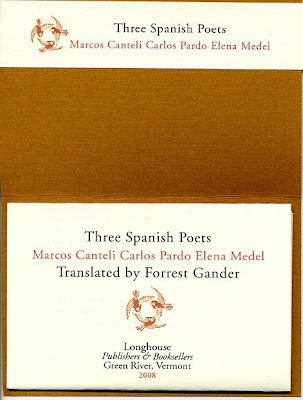 This prize is worth £5000 to the winning author and £1000 to the translator. In all there are eight awards in contention, the others being the Steel, Non-Fiction, New Blood, Library, Short Story and Debut Daggers. Looking for more news about the CWA and its Dagger awards? Check out www.thecwa.co.uk. The Black Goat imprint of Akashic Books is specially reserved by Nigerian author Chris Abani for publishing well-crafted poetry with "a proportional represetation of female, African, and other non-American poets." Karen Harryman fits in the first category -- growing up working class in the South (Kentucky, Bourbon country), then migrating with her lover to Los Angeles. Young, blunt, and adept at colorful narrative, Harryman spins poems of place and of the transition from one side of the country to another; from nearly-country to absolutely city; and from hopeful and bold single girl to someone who realizes both the cost and value of staying in a relationship. So what she writes in AUTO MECHANIC'S DAUGHTER are not "love poems," but poems of a willingness to love. I like the determined blunt optimism and joy here. She tackles loving herself, and being in love with life. Truth comes in bright flavors and colors, with grit that catches in teeth. to Red Rider in the front seat, let the car drive itself. And it flashes with such delight on the page that coming later to the poem "Convalescence" is shocking: a poem that ranges from oily hairbrushes to dirty pajamas and aging in a wheelchair, wrapping up, "I don't remember the poem as a young thing, / only this burden having its say, roundabout, / lodged tumor-thick, pressing agaist my words." Whoa, who changed the music here? Harryman is equally direct about whether love is all good, or sometimes a trap soaked in two people's disillusionment. Her version of a couple touring in London includes a long period of not liking her partner -- "The truth is we stepped off the train together / and went on loving what it is that we don't hate." Ouch. And yes. The most vivid poems here share the brashness of Ellen Dudley's Geographic Cure, of Anne Sexton's flirtations, of love and lust that mingle and don't hide from the light. And they are flavored with Kentucky or Los Angeles in turn. I'm glad to say that Saturday's Poets' Brunch gathered a mellow group that thoroughly enjoyed readings from Dzvinia Orlowsky and Jim Schley, including learning background on the ideas and poetics in their new collections. And there are signed copies available from both poets -- Dave and I will list them on Monday, for access via ABE Books (use our web site, www.kingdombks.com, to go directly to our list). Also ahead: A review of AUTO MECHANIC'S DAUGHTER by Karen Harryman. An exploration of the Laos-set mysteries of Colin Cotterill. And a look at why Barry Moser's illustrations are poetry themselves. 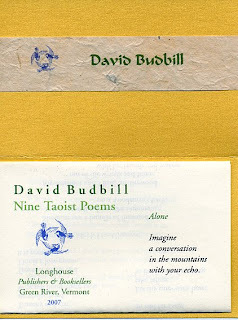 Oh yes, and some gorgeous new creations from the fine press of Longhouse, Bob and Sue Arnold. An article in the New York Times on June 7 pushed me into writing my first e-mail to one of the paper's reporters and another to the MTA, the Metropolitan Transit Authority. Short version of the newspaper's announcement: The trains, subways, and buses of New York are about to have a LOT less poetry on them, because an MTA official had the thought, "Why not prose?" This lightbulb question took place after a stunning number of people had written to the MTA to say how important its Poetry in Motion was -- how the poems were memorized, or acted as triggers for better life, or woke people up to what poetry could offer to them. I hope others are also protesting this change. Hey, I love prose in its place -- I read nearly as many mysteries as my husband Dave, who is the mystery pro in Kingdom Books -- but I don't memorize it, I don't sing it, and I don't quote it in times of stress, change, or passion. And that's "Why not prose?" answered. Here's a list of what's ahead in comparison to what Poetry in Motion has already offered. Be advised: There will be only one poem a year on the subways soon. Or tehre could even be ... gulp ... none. Each year the MTA and the Poetry Society select poems and post them on New York City's subways and buses. What better salute to summer than a pair of poets reading from new work... Kingdom Books welcomes Dzvinia Orlowsky (who drove four hours to be here!) and Jim Schley, for our Poets' Brunch, Saturday June 14 at 11 a.m.
glide through the party like paper dolls. they buzz when I lift them to my face. We also have Orlowsky's earlier work available. any breath may shift to song as it leaves one. Pine Manor College announces its annual Solstice Summer Writers’ Conference Reading Series. All readings are held in the Founder’s Room of Pine Manor College, located at 400 Heath Street in Chestnut Hill. Copies of the authors’ books will be available for sale after all readings; cash-bar receptions will follow the readings on June 22, 27, & 28. Plenty of free parking! Sunday, June 22 at 7:30 p.m.
Thursday, June 26 at 7:00 p.m.
Friday, June 27 at 3:15 p.m.
Friday, June 27 at 7:00 p.m. Directions to Pine Manor College, complete bios of the authors, and more information about the 2008 Solstice Summer Writers’ Conference can be found at www.pmc.edu/solstice. Beach reading for me is mysteries. Vermont, of course, only has lakeside beaches, not ocean ones, and in weather like yesterday's, when we lost power, phones, and Internet, the beach is internal -- but hey, it still calls for a good book. Dave was reading an advance copy of Archer Mayor's fall offering, THE CATCH, as we sheltered at a local hotel that still had electricity (good generators?). Me, I was wrapping up a Magdelen Nabb, inspired in that direction by Marilyn Stasio's Sunday review in the New York Times of the latest Nabb mystery: VITA NUOVA (Soho Press). It's an ironic title, all things considered, since Nabb died last August and is perhaps in a distant new life of her own. But the new release is clearly not a radical departure from her other Florence, Italy, police procedurals featuring Marshal Guarnaccia. Head of the police unit headquartered at the Palazzo Pitti, Guarnaccia's charm for the reader is that his mix of love of region and personal quiet alienation allow him to ponder the larger strands of what is taking place around him. When his investigation leads him into a web of domestic violence and secrecy, he rediscovers the tragic level of social acceptance of such punitive actions. Strong men often become so in opposition to the women in their lives -- at least, this is what the Marshal finds around him in Florence. It's not his first deep, slow, sorrowing insight. But it is probably the last such tale, and well worth adding to the bookshelf as an endstop to the Nabb books. By the way, the official author web site, www.magdelennabb.com, was sadly out of date when I checked it today, so use the material that Soho Crime offers to supplement your exploration. I mentioned Grace Brophy's new mystery through Soho a few days ago; I don't have a copy yet, so I won't say more, except to recommend her earlier book, THE LAST ENEMY. Last but not least, no beach reading would be complete without a Donna Leon book. 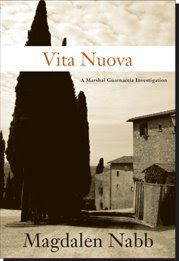 We're seeing a strong passion here in Vermont for this series -- maybe because Venice is so very different from Vermont, or maybe because of the gentle reserve with which Leon paints the key marriage in the book, between her lead investigator Commissario Guido Brunetti and his wife Paola, a smart, strong, woman with considerable skills in the kitchen, in childrearing, and in her work -- and a good listener when Brunetti finds himself able to talk a bit about the distress and pain that policing leads him to witness. I like DOCTORED EVIDENCE and DRESSED FOR DEATH; the latest Leon is THE GIRL OF HIS DREAMS. There's good reading material on Leon's web site, www.donnaleon.co.uk, where you can also see the British cover design -- different from the US version and very nice indeed. When Graywolf Press last fall released its second Matthea Harvey poetry collection (her first book was through Alice James Books, PITY THE BATHTUB ITS FORCED EMBRACE OF THE HUMAN FORM; her second, the first Graywolf one, was SAD LITTLE BREATHING MACHINE), word quickly circulated among poets: "She's done it again." The book was soon on the National Book Critics Circle finalists list for an award in poetry. 1. "Modern" forms: prose poetry alternating with playful stacks of lines that read like English narrative but actually zigzag across landscapes of fragile connections, playing as much with the words as with their pathways. 2. "Modern" issues: terror. And the future. The book's structural pillars are a pair of series: "The Future of Terror" (11 poems) and "Terror of the Future" (10 poems). There's also a seven-poem sequence about Robo-Boy, unexpectedly touching in the puzzlement of the mechanical creature with real feelings. The Future/Terror, Terror/Future sequences are each created in abecedarian fashion, using words between FUTURE and TERROR in the dictionary. Despite an appearance of random strings, each is also a braid of threat and survival: In "The Future of Terror" there's a generalissomo, there are paratroopers and inclinometers, there's a missing airlift. Then in "Terror of the Future," protests, tears, and telesthesia mingle. Harvey plays out the loneliness of being part of a group, and the un-loneliness of being part of a plan. There was one shot left in my rifle. Also delightful is "Word Park," a prose poem that begins, "Proper nouns are legible in any light and like to stay near their cages." (This is, I think, the only piece in the collection to include CHOCOLATED.) And best of all for whimsy and wonder is "Waitressing in the Room With a Thousand Moons," where the trials of waiting table with little and large moons swinging past are detailed. Harvey lives in Brooklyn and teaches poetry at the graduate and undergrad levels at Sarah Lawrence. There are several reviews of MODERN LIFE available, but it's more fun to read the interviews with this inventive poet. Try the one at the bookslut blog; it's almost a good as having coffee with the author. The Rural Heritage Institute at Sterling College, Craftsbury, Vermont, begins Wednesday June 11 and goes through Sunday June 15. The hands-on program emphasizes the heritage of Wendell Berry in terms of language, place, and rural community. Details are on the web site: http://www.sterlingcollege.edu/rhi.html. Wednesday June 11: Keynote Address 7:30 pm - Willem Lange, author of Where Does the Wild Goose Go? and Intermittent Bliss and commentator for Public Radio. Thursday June 12: Regional Music 7:30 pm - "Fireside;'with Bennett Konesni. A musical hybrid of old-time Appalachian songs and Scandinavian fiddle tunes. Northern Vermont Writers, 7:30 PM - Leland Kinsey, poet and author of several books including: Sledding on Hospital Hill: Poems and The Immigrant's Contract. - Natalie Kinsey-Warnock, children's author of several books including: As long There are Mountains, The Canada Geese Quilt, and The Bear that Heard Crying. Artist's Presentation, 7:30 pm - John Miller, photographer and author of Granite and Cedar and Deer Camp. This is the sixth in the highly successful series featuring Episcopal priest Clare Fergusson and local police chief Russ Van Alstyne, caught in small-town disasters not far from Saratoga, in the Adirondacks. When book five (ALL MORTAL FLESH) ended, Clare and Russ had been through the kind of trauma that can permanently separate people who dearly love each other: Clare killed a dangerous psychopath in order to save Russ, whose wife meanwhile died in a catastrophe that both Clare and Russ would have done everything to prevent -- but didn't have the chance. And after walking away from becoming lovers when Russ's wife lived, the two seem permanently unable to get past this death. That's where things stand as I SHALL NOT WANT opens. And although the pair struggle to not cross each other's paths, the town of Millers Kill provides all the coincidences and enforced closeness of an extended family. When Clare leaps to the support of the region's least fortunate, the Mexican migrant workers on the local farms, she's bound to run into Russ -- trouble follows on the heels of poverty and oppression, and Russ's task is to sort it out. Bottom line: They both follow inner compulsions to see that justice is done. And they both have one heck of a lot of anger and pain to sort out, from what's happened between them. "All right, dammit! Yes! If I hadn't gone into that goddam barn my wife would still be alive." He surged to his feet and grabbed her by the upper arm. "But don't you see? You would have been dead. You would have been the one to die..."
Spencer-Fleming's willingness to braid suspense, danger, humor, and passion creates a must-read novel that goes well beyond the crime/mystery genre. I completely forgive her for taking so long on this one -- because she got it completely and compellingly right. 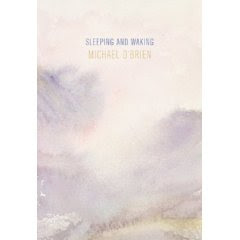 I opened Michael O'Brien's book SLEEPING AND WAKING without knowing anything about the book or poet -- except that the book was a finalist for the National Book Critics Circle Award in Poetry this year. That's a good way to enter, with the probability that someone has found this remarkable. A small, pot-bellied woman in a bright green dress speaks antiphonal, incomprehensible sentences by the Seventh Avenue subway, possessed, testifying, rocking in place with the voices, their repeating decimal, ghosts that feed on speech. Nearby a man, head raised, eyes closed, is drinking the sunlight. He takes his time. His thirst is great. The ferocity of detail grabs at me. I'm not there, but I know the scene. The moment. 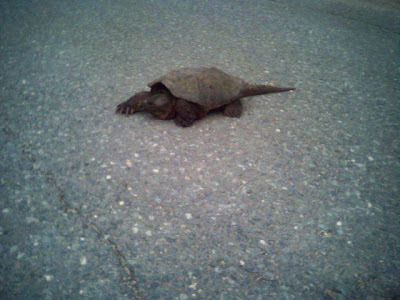 Wasn't it last spring when I walked past the park, on my way to lunch with ... ? At least, it feels that familiar. Which is exactly the grasp that this quietly presented collection creates: the grasp of a dream half remembered, or the startle of waking from what seemed real. O'Brien's skills are honed and seasoned. Born in 1939, he began presenting his poems while a member of the Eventorium, a "scene" of surrealist writers, artists, and filmmakers "way uptown" in New York in the 1960s. 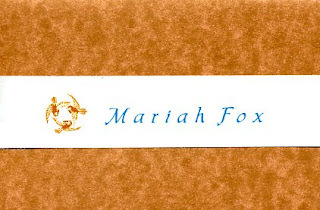 The jumps from short-lined, heavily enjambed, collage-style poems to prose offerings to tight little narratives belie the quiet, soft-pink-and-fog artwork on the wraps of the book (Flood Editions, Chicago, 2007). And the carefully selected "cut-ups" of language and scene are an invitation to add narrative along the edges -- an urge that Fanny Howe suggests is always present when we confront words, especially words in sequence. The collage of urban life's moments and scenes becomes an invitation to story. Yes, this is also Zen, catching a moment, a vista, and pinning it simply onto the paper, available to step around. I like what O'Brien has done here. I'll be collecting his earlier work. By the way, there's a dandy review of the book by David Orr, who knows O'Brien's work well; check it out in the NY Times archives. Summer Saturdays: They're precious. I linger over my tea as Dave hugs his mug of coffee and we pass the papers back and forth. Whose work has been reviewed where? What other books do we need to buy? But I know we're not typical. Most people head outside for yard and garden work, or scoot to the hardware or home store for supplies for weekend tasks. And that's why, this summer, Kingdom Books is offering poetry readings as nice late 11 a.m. brunches on Saturdays -- a time to stop after all the running and racing, refill the tea or coffee or even iced beverage, and mellow out with contemporary poetry, whether lyric or narrative, formed or edgy. Waterford -- On Saturday June 14, at 11 a.m., noted poets Jim Schley and Dzvinia Orlowsky will read from their new collections at a poetry brunch at Kingdom Books. Schley, who lives in North Strafford, Vermont, is the author of many poems featured on Garrison Keillor's radio show "The Writer's Almanac" and in Keillor's book "Good Poems," as well as in "Best American Spiritual Writing" and many magazines. His new collection, "As When, In Season," has been praised by award-winning American poet Hayden Carruth, who said, "I like these poems immensely." Direct, evoking both the New England landscape and that of the heart, Schley's poems celebrate and sing. Reading with Schley is Massachusetts poet Dzvinia Orlowsky, whose work has won a Pushcart Prize. Orlowsky is a founding editor of Four Way Books, and is an accomplished translator as well as author of four books of poetry. She'll read from her widely heralded new collection "Convertible Nights, Flurry of Stones." The poems are lyrical and often strongly narrative, rooting in the frightening diagnosis and treatment of breast cancer -- from which, with this book, Orlowsky "radiates light in the darkness." 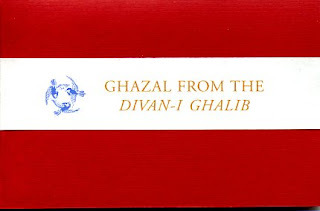 Books by both poets, including their earlier work, will be available for purchase. Reviews of the work can be found at kingdombks.blogspot.com. Please call ahead to reserve copies of the new books. Kingdom Books is a poetry and mystery specialty shop at 283 East Village Road, Waterford, open for special events like this one and by appointment; contact the shop at 802-748-5488 or KingdomBks@aol.com. And the next Poetry Brunch will be -- Saturday July 12, with poet April Ossmann, who's also earned her stripes as publishing editor for Alice James Books over in Maine. Same time, same place. Mark your calendar. Living in a global marketplace means the foreign mysteries are coming at us so much more easily than even five years ago. 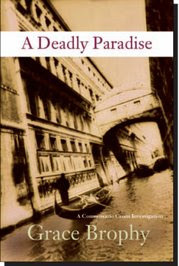 I'm eager to read A DEADLY PARADISE by Grace Brophy, with settings in Venice, Murano, and Umbria. Soho Crime also just released SILESIAN STATION, espionage by David Downing. Way to go! Check out the latest Soho Crime newsletter. KCRW is a college-based radio station in Santa Monica, California. Its program BOOKWORM reaches out to a range of poets for interviews that include reading their work. I checked the web site today for the interview with shamanist poet and translator Clayton Eshleman, and found a terrific exploration in Clayton's own voice of his recent collection AN ALCHEMIST WITH ONE EYE ON FIRE (Black Widow Press). Eshleman spoke of "the grotesque" as a meetingplace of the unconscious and the conscious; of the profound effects of having spent 48 years engaged with translating the poetry of César Vallejo (see The Complete Poetry of César Vallejo, edited and translated by Eshleman); and of the poet as an initiate. Most astounding is the long, delicious, and outrageous final poem of AN ALCHEMIST, especially as read aloud by Eshleman himself. There's also a nice discussion of the way his wife Caryl collaborates in the work. Whether it's just my computer or a general effect of the radio station's web site, from the Eshleman interview the machine flowed onward and played the next piece archived, a notable (but too short) interview with "poetry of witness" poets Brian Turner and Bruce Weigl. In addition to the provocative poems of the conflicts in Iraq and Vietnam as spoken by these two men, there are flickers of insight into the net of mentors in the field, specifically Charles Simic and Carolyn Forché for these poets.